I lived in Wladimir-Wolinsk until 1941. From 1941 to 1943 I was locked up in the local ghetto where, doing forced labor, I was treated so badly that I am no longer able to describe it today. There was no pay and nothing to eat. We secretly had to steal raw vegetables, and we sold everything we still had for a piece of bread. In 1943 I was hauled away to Posen, where I had to perform forced labor under the harshest conditions as well. In 1945 I was brought to Berlin, where I was subsequently freed by the Americans. Handwritten near the top in the left margin is the word "copy." 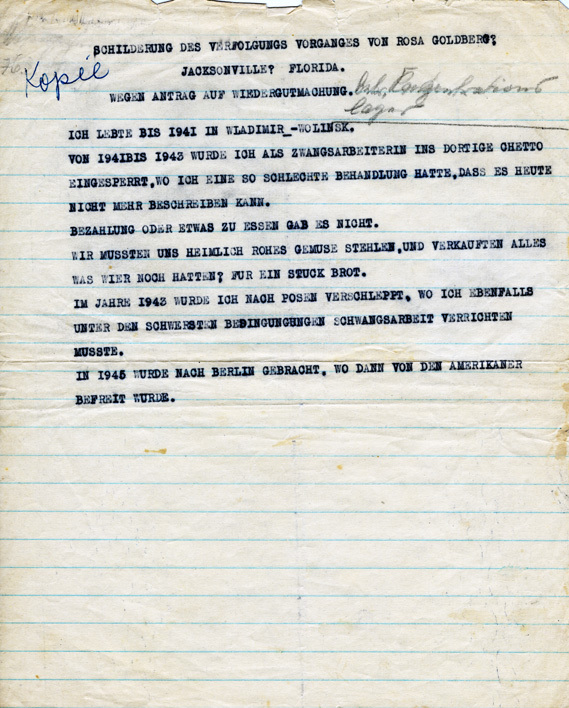 To the right of the title, in another, older handwriting, are the words "concerning concentration camp." - Trans. 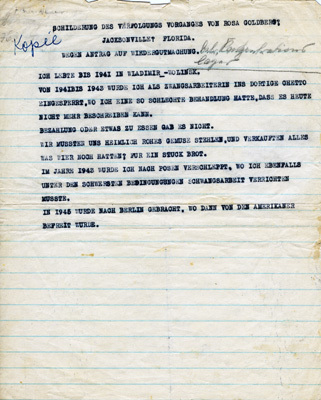 A copy of Rosa Goldberg's short narration of Nazi persecution. A translation is to the right.